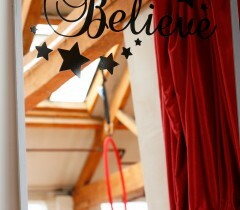 We offer aerial hoop, silks, cube, trapeze and much more. Learn to fly high and even perform in one of our regular showcases! Pole fitness is a great new way to get fit and tone up while having a giggle. Feel empowered, get stronger and have fun! One of the most beautiful aerial disciplines, Aerial Silks is a length of specialist material suspended from the rigging which enables you to climb, create shapes and perform sequences while suspended off the ground. 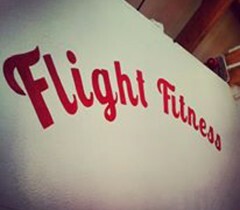 Flight Fitness is an alternative fitness studio set up in 2012 by Lauren Red. She wanted to provide a place where everyone could feel safe, have fun and sharpen their skills for an affordable price. Her 5,000 square foot studio just off Narborough Road in Leicester definitely achieves this. So why not come to a class and check it out! 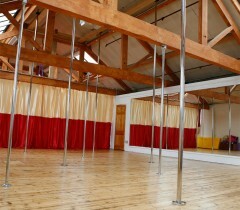 19 poles and the tallest poles in the Midlands. Guaranteed small numbers to a pole. 2 aerial hoop bays, 1 aerial A frame & various hoop sizes to cater for every shape & size. All the home comforts you need - 5000 square foot studio, changing rooms, toilets and full kitchen.